Back on Toolroom Records with their debut album 'Cyclic Operations', Spektre could possibly be smashing the techno charts as Filthy Rich and Paul Maddox deliver their artist album. The duo are ones to watch, gaining support from some of the world's best techno DJs and producers including Carl Cox, Dubfire, Richie Hawtin and Sven Vath. They’ve also had collaborations with UMEK, Christian Cambas, Miniminds, Subfractal and remixes by artists including Uto Karem, Jon Rundell, Gorge, Nicole Moudaber, Christian Smith and Wehbba. Returning to Toolroom after their debut 'Turbine' featured on the ‘Rhythm Distrikt’ compilation, the duo are back with a release which showcases their hooks and sounds alongside vocals and deep, atmospheric tones. 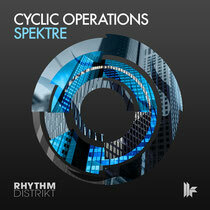 'Cyclic Operations' captures the best of Spektre's sound as they delve into the darker side of techno. Including 14 tracks and a full-length DJ mix, the album is divided up by a series of short musical interludes; 'Introduction' with its dark vocals, 'Intersection' with its futuristic, apocalyptic feel and 'Intervention' which is more uplifting and upbeat. Album highlights include 'Let Me Tell You' which features the vocals of Montserrat, 'Sense In Madness' with its spooky synths and basslines, the mystical 'Ghosts In The Machine' with its futuristic sounds, the feel good 'Opus' and 'Steel City Sunrise' which ends the album with smooth echoing vocals and a chilled melodic atmosphere. It’s out 4 November.